Are you ready to use your sewing powers for good!? Today kicks off a month-long sew along to benefit Sadie’s Dream for a Cure. 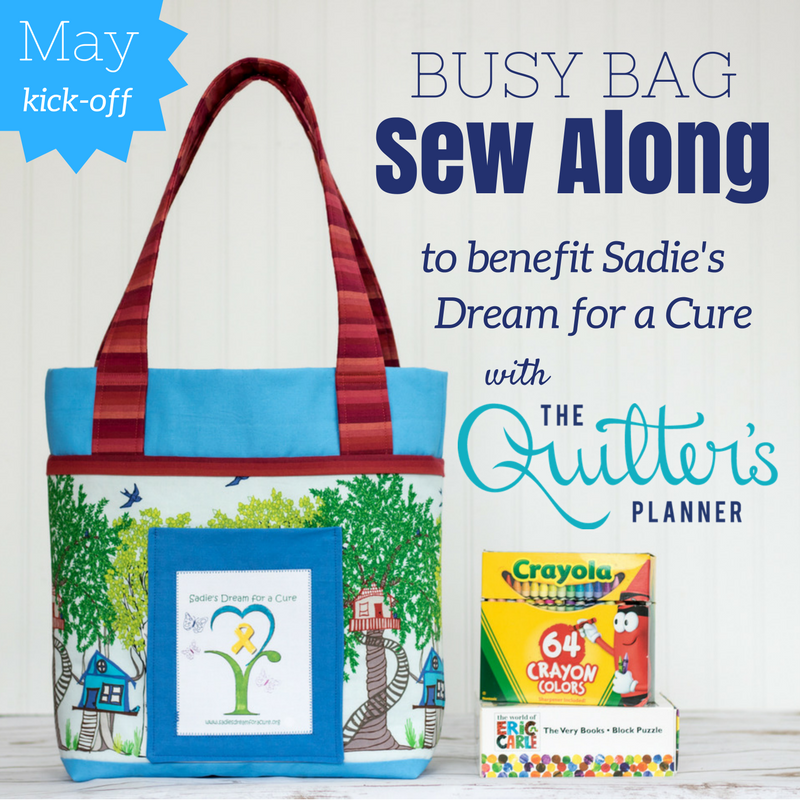 During the entire month of May, we will partner with Sadie’s Dream to sew Busy Bags (simple tote bags) that will be filled with crayons and art supplies and small toys for children with life threatening illnesses. Sadie’s Dream is an incredible organization, founded by Jessica and her mother, in honor of Jessica’s beautiful child named Sadie, who was diagnosed with cancer at 6 months of age. Sadie’s Dream offers support to children who are in the hospital receiving treatment for cancer by providing them with tote bags filled with toys! 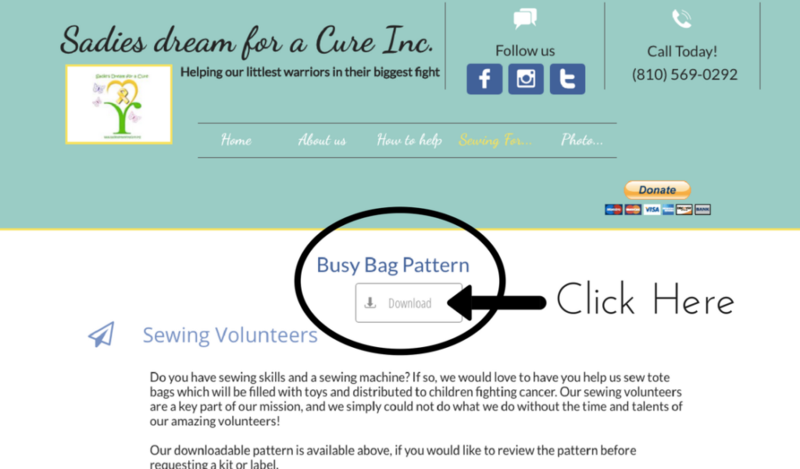 They ask volunteers, like you and me, to sew reusable fabric tote bags using the pattern on their website. You mail the completed bag to Sadie’s Dream and they fill the bags with coloring books, crayons, books, craft projects, card games etc. – Then they give these Busy Bags to children while they are in the hospital, often immobile and hooked to an IV. They also make parent bags – “Basics Bags” — which are filled with emergency supplies for parents who might find themselves unexpectedly at the hospital following a shocking diagnosis with only the clothes on their backs. It’s an amazingly generous organization, and we hope you will join us in using your sewing powers for good to help make bags for as many kids as we can! Before you say “But I’ve never made a bag! I can’t do this!” and head off for the next sewing project, let me tell you–yes, you can! Neither Stephanie nor I have any kind of bag-sewing experience or confidence, yet the instructions are very clearly explained and simple to execute. Plus, we will help you along the way! Yes, you CAN sew this bag!! Go to Sadie’s Dream website, specifically the “Sewing for Us” tab (linked right here) and fill in the form at the bottom of the page to order either a label to sew into a bag made with your fabrics, OR a kit that will include all of the materials needed to make a bag. Sadie’s dream will mail the requested label or kit to you, and from our experience, you should receive them in a couple of days! Join us on the Quilter’s Planner Instagram or Facebook page and sew along with us to make the Busy Bag Jeremie pattern provided on the Sadie’s Dream website. We will spread the bag-making over the course of the month, so that it’s at a manageable pace for those who have little experience sewing bags (like me!). See the full schedule below. Feel free to sew two bags at once and put both labels to good use! Tips and guidance will be shared along the way, and we hope that the bag-making pros among you will share your support and tips as well! Ask any questions along the way and we and our amazing sewing community will be happy to help you! If you are a bag-making pro, you are absolutely welcome to make the bag (or many bags!) at your pace. Don’t let us hold you back! Post a photo of your finished bag on Instagram or Facebook, tagging #busybagsewalong and @thequiltersplanner @sadiesdream so that we can add it to our tally and celebrate your success. That’s it! We are hoping that with your help we can meet and exceed our goal of sending 25 bags to Sadie’s Dream by the end of May! Please feel free to spread the word, since the more people sewing along to use their sewing skills for good, the more good we can create! May 1st – Busy Bag Sew Along Kick-off! May 15-21 – Sew the bag together! Before May 31st – Tell us how many bags you have made and mailed so that we can add it to our tally and hopefully fly past our 25 bag goal! We’ve put together a list of FAQ to try to answer any questions you may have. If you have any other questions, please feel free to contact me (Kitty) at kitty@quiltersplanner.com or via direct message on Instagram on @thequiltersplanner feed. I’ll do my best to help you as promptly as I can, but please be patient since I am only one person and a mom of three little kids, too! Where can I download the Busy Bag pattern? Is it free? The Busy Bag pattern is free and can be downloaded on the “Sewing for Us” page on Sadie’s Dream’s website. Click the button that says “Download” and the file will be saved in your downloads as a *.pdf. The pattern is called “Jeremie Pattern”. What happens if I order a label or kit but am unable to make or finish my bag? If you request a kit and are unable to complete it, or don’t wish to make the second bag (two labels are sent with each order), Sadie’s Dream just asks that you return the unfinished bag or the second label to them. They just put the unused label back in their stock and include it in the next kit they send out! May I fill the bag before I mail it back to you? What should go inside? You do not need to fill your bag, but if you choose to fill the bag, there are three hard and fast rules: no food, no religious items, and no violent-themed items. The hospitals also require that all donated items are new. They cannot accept used toys, even if they are in the very best condition. Sadie’s Dream also tries to stay away from any obviously holiday themed items, as not everyone celebrates the holidays in the same way. Beyond those basic requirements, each bag should be age appropriate (ie., a teenager doesn’t get the same things as an infant). Sadie’s Dream usually focuses on coloring books and crayons or art supplies (adult coloring books are great for the older kids). Puzzles, play doh, Barbies, Match box cars, card games, and small board games are all staples. For teenagers, they also would include nail polish, or some type of model kit or building kit, such as erector style sets. Legos are also great! If all of these guidelines send your brain into a tizzy, feel free to make your bag and include: 1 Barbie, 1 card game, 1 puzzle, and one small Lego kit. And thank you for going above and beyond! May I make a bag other than the Busy Bag Jeremie pattern on the Sadie’s Dream website? Due to copyright issues, Sadie’s Dream does not encourage making patterns other than their own pattern. 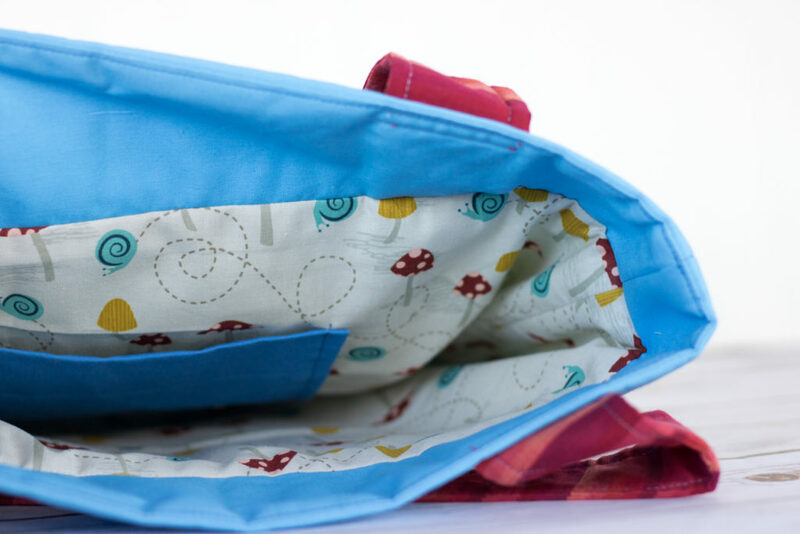 Additionally, their pattern has been specifically designed to their size requirements to a) maximum the space available to stuff it full of goodies, and b) to be a useful, kid friendly tote that kids can use over and over again. If they do receive items that are made from different patterns, they generally will donate them to another charity that can put them to good use. I don’t live in the United States. May I still participate? Yes, you may make and send a bag to Sadie’s Dream, which is located and serves hospitals in the United States. They will mail labels to other countries but not kits. Sadie’s Dream has had volunteers from Canada in the past; please be aware that shipping is expensive and items often get significantly delayed at the border. However, if you are comfortable taking this risk, you are welcome to participate. May I make the bag without ordering a label? Yes! If you make a bag and send it to Sadie’s Dream, they can attach the label. In this situation, Sadie’s Dream asks that you sew the pockets, but leave the front pocket off, so the label can be attached to it before they hand stitch the pocket on for you. Thank you! I am not sure if I will get the label in time. May I make the bag and send it without a label attached? If you cannot attach the label, Sadie’s Dream asks that you sew the pockets, but NOT attach the front pocket to the bag. When you send everything back, the team at Sadie’s Dream can then stitch the logo to the pocket and attach the pocket to the bag. It doesn’t give as clean of a finish as putting the label on in the construction of the bag, but they have never had any child complain that their pocket was sewn on after the fact! May I stitch the label to the inside of the bag instead? The label should always go on the outside pocket. This helps Child Life staff at the hospital easily identify the bags and get them to children more quickly. Hospitals to whom they have donated on a regular basis are familiar with their bags, what they can expect to find inside of them, how they are labeled, etc. It also helps Sadie’s Dream’s branding and helps promote the cause when people share pictures of what they have made on social media. I just ordered a label and/or kit! When should I expect to receive them? Kits and labels are generally sent out within a day or two of receipt of the request. Thank you so much for joining us in sewing for this great cause, and please spread the word! Feel free to bring this idea to your weekly sewing group, your quilt guild, or rope in some friends who have been wanting to learn to sew. The more bags that are made, the more kids can be helped. Let’s stitch from the heart!